We offer a full line of roll-off dumpsters. The sizes range from 10, 20 30 and 40 yard containers. 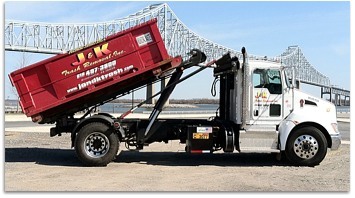 When you call J&K for a dumpster "near me", you receive fast and expert service. Waiting more than 24hrs to receive a container or a pickup is a thing of the past. We pride ourselves on this service and it is the foundation upon which this company has been built on. You will find that our rates are among the most competitive in the industry, without sacrificing service. We specialize in demolition disposal and commercial compactors, servicing construction and demolition companies, food markets and industrial complexes. With our small roll-off truck, we can deliver our 10 yd containers to the narrowest of driveways without doing the damage that a full size truck would do to the property. We service Delaware County, Chester County, and Montgomery County, Pennsylvania. Along with our open-top containers, we also service self-contained compactors, break-away compactors and recycling containers. If you are looking for a dumpster "near me" Please Call us Today at 610.816.6347 or fill out the form for your free estimate.